The largest solar project ever built to serve a Minnesota school district began producing energy last week. 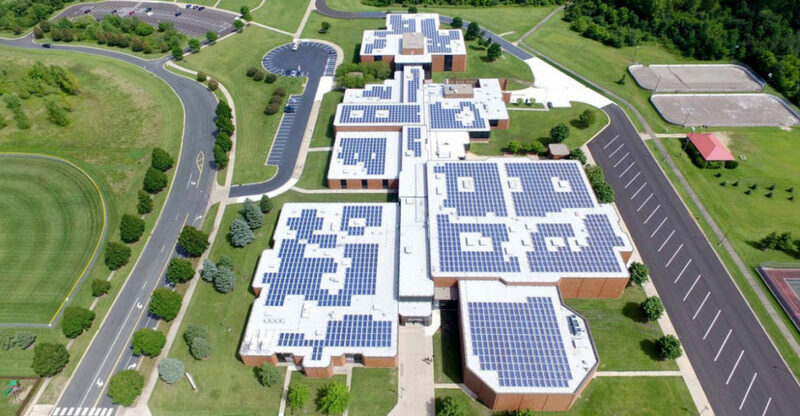 The Farmington public school district’s 3.1 megawatt (MW) project places photovoltaic panels on the rooftops of several buildings. The first project to go live is the 715 kilowatt, 2,200 panel installation on the roof of Dodge Middle School, with more buildings to follow. Once fully completed next year, the project will be one of the biggest rooftop solar photovoltaic installations ever built in Minnesota by a government entity. Read more here. As in Minnesota, Nebraska K-12 schools, colleges and universities have the option of investing in solar through third-party financing, or in some communities such as Kearney, subscribing to a community solar development. Model for Nebraska: Solar4Schools, which Frank Jossi references in his article, is a program created by IPS Solar that, for over a decade, has installed PV arrays at a number of Minnesota K-12 schools as well as colleges and universities. These include: Macalester College, Northland College, St Johns University, St Olaf College, University of Minnesota and University of St Thomas. This entry was posted in Community-Scale Solar, Nebraska / Midwest News, NewsBlog, Solar Schools and tagged Midwest schools subscribing to community solar, model solar schools program for Nebraska, Nebraskans for Solar, SoCore, Solar4Schools, third-party financed solar, University of Nebraska-Kearney on November 14, 2017 by Helen Deffenbacher.